Traditional notebooks are annoying. Any serious note-takers or doodlers will admit that they go through notebooks quickly, which means stacks of notebooks to store in your closet. Instead of buying notebooks again and again, what if you had one notebook that could last forever? 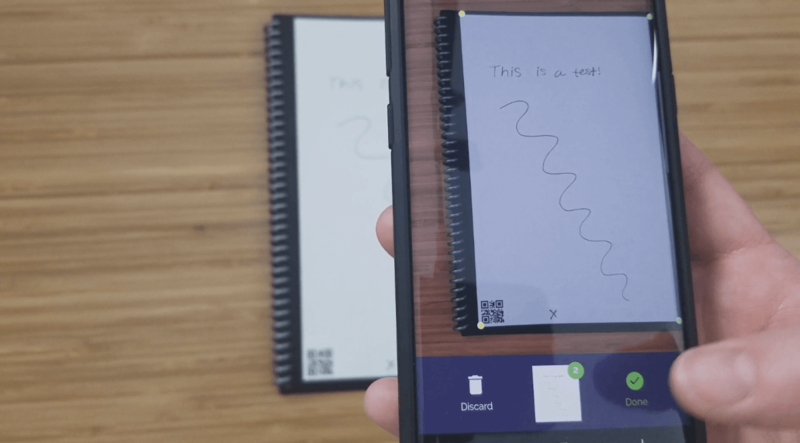 Rocketbook wants to replace your old school notebooks with a reusable, never-ending notebook that uploads to the cloud. For our Rocketbook Everlast Review, we tested out the popular notebook to see if it could really replace old fashioned pen and paper. Let’s see what we found. 1.6 Is it Worth it? 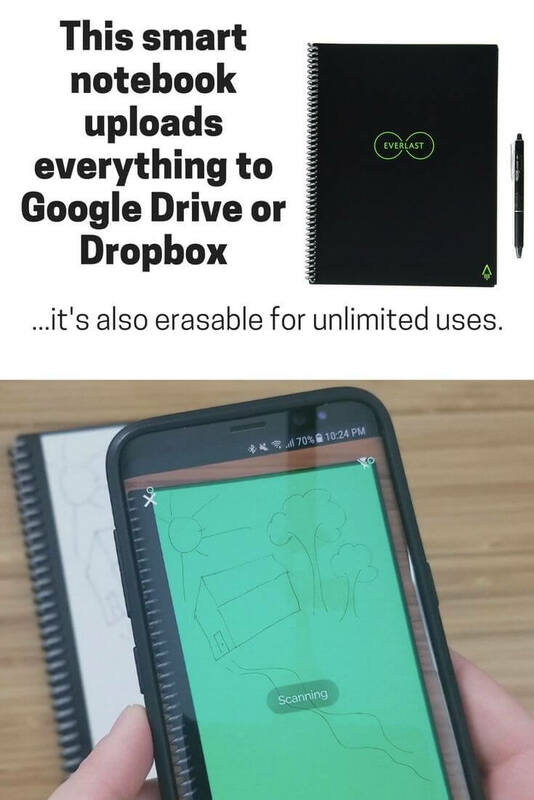 First thing’s first: how does this notebook actually get your notes and doodles to the cloud? It’s simple. Each page has 7 symbols on the bottom. Once you’re done with a page, you mark the destination for your upload. Within the app, you can specify what each symbol means; for instance, the apple can mean that your notes go to a specific Google Drive folder, while the star sends them to a channel on Slack. Once you set up the destinations in the app, it’s as easy as opening the app, scanning the page, and clicking Done. The scans will instantly send to the different cloud services. There is only one pen recommended for writing on the Rocketbook: it’s the Pilot FriXion. These pens come in a variety of colors and sizes, and one 0.7 mm pen is included with the notebook. The Rocketbook Everlast notebook has a very distinctive feel. The pages aren’t quite traditional paper, but they aren’t dry erase either. Since they are super smooth, at first I was doubtful that the ink would dry. There’s nothing more annoying than writing that smudges onto your hand or to other pages in the notebook. Rocketbook promises that their ink will dry in 15 seconds. In testing for our Rocketbook Everlast review, the ink was close to dry after that amount of time, although I’ll probably round up and give it 20-25 seconds to play it safe. If you’re left-handed, you may want to check out a 0.5 mm Frixion pen or thinner for a faster drying time to reduce smudging. Once you’re done writing and uploading your notes, you can easily erase your writing with a drop or two of water. My favorite method is to use a small microfiber towel and get a corner wet. I use that corner to wipe off the ink, then I use the dry side of the towel to mop up any remaining water. The writing comes off instantly, but don’t start writing on the same page immediately. Only write on completely dry pages. History: this lists a gallery view of all of your scans. If you upload multiple scans at once, they will be grouped into one icon. Destinations: edit the destinations in this section to specify where your scans should send. This will require you to login to each service, but only once during setup. Besides choosing a destination, you can also select file type (pdf, jpeg, or gif if there are multiple images), bundle scans into one PDF, and turn on auto-send if you want the scanned images to instantly send to their destination. Settings: customize your experience in this tab. There are actually quite a few interesting options here for adjusting your scans quality, resolution, etc. There are plenty of options for how to organize your Rocketbook. If you’re a student, you could set up each destination for a different class, and have the notes upload to that class’s folder in Google Drive. It’s very customizable for whatever you need. 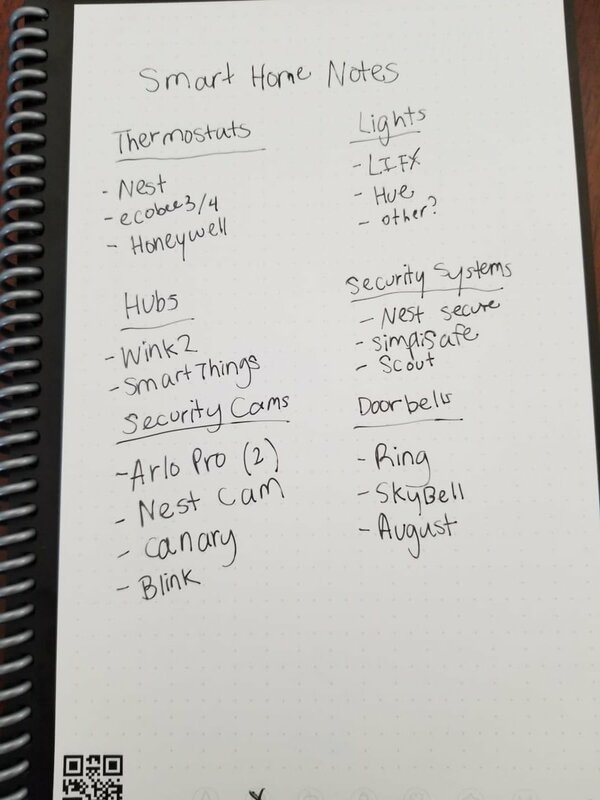 The alternative to Rocketbook is obviously taking a photo of your notebook. Below is a comparison of the quality, with an image of the notes on the left and a scan on the right. 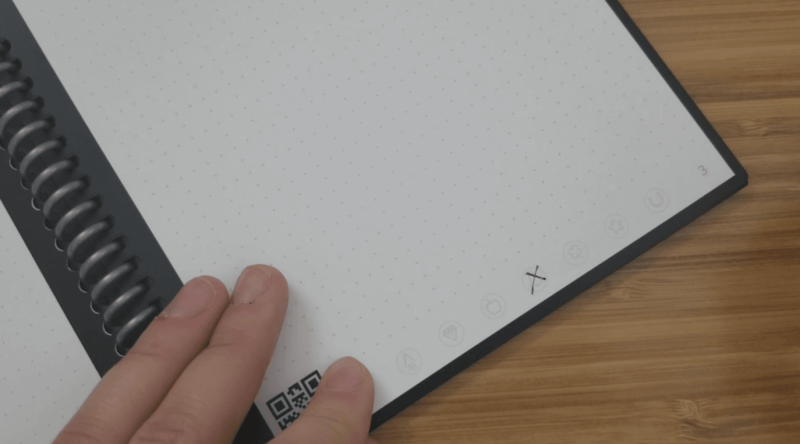 When it scans, Rocketbook removes the tiny dots that are on the page, in addition to the symbols at the bottom and the QR code. The app scanned all images instantly, without any quality issues. Even if you don’t hold your phone perfectly steady during the scan, the uploaded images looked high quality and clear. Besides image quality, the other benefit we found in our Rocketbook Everlast review was that the images instantly uploaded to a designated folder. Otherwise, if I’m taking images of my old school notebook, the pictures usually just clutter my camera feed and make it disorganized. 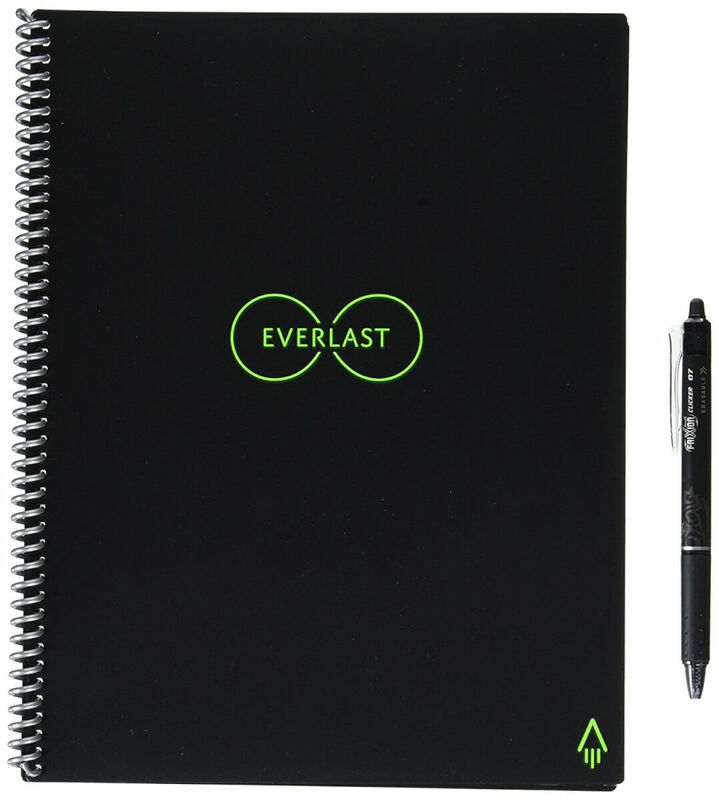 Rocketbook Everlast comes in the Executive size (6″ x 8.8″) or the Letter size (8.5″ x 11″). Executive comes with 36 pages, while the Letter only has 32. The notebook has a plastic spiral ring and thick front and back plastic covers holding it together. It has a small logo on the front in green letters. The inside of the front cover acts as a Table of Contents, where you can list the different destinations for your book. It is erasable just like the pages. FriXion pens are a favorite for many, so it’s a big perk that this is the compatible pen for Rocketbook. The pen has a nice feel to it and clicks using the clip on the side. The pen has an eraser, but don’t use it on the Rocketbook! This can seriously damage the pages. Everlast has a nice look to it. The notebook is appears high quality and a little futuristic, but not gimmicky. If you are a student, artist, or avid notetaker, the book will likely blend in nicely with whatever your style is. Compared to other notebooks, it isn’t extremely professional looking, but I still feel that it would blend into most work environments well. Side note: if your notebook is left in a hot car or surpasses 140 degrees Fahrenheit, then your writing may appear faded. Don’t freak out, just put the notebook in your freezer and after about 20 minutes, the writing will reappear. Crazy, but true! In the end, Rocketbook Everlast lived up to my expectations and I can see why it has so many positive Amazon reviews. The notebook has a low price point considering its reusability. I’ve been using it for months now without any frustrations. It’s easy to write on the pages, upload my notes instantly, and erase the pages for future use. It’s certainly one of those “I-can’t-believe-this-didn’t-already-exist” inventions because it really changes how you take notes and makes workflow way more effective. Besides being a useful tool, once you add in the price and obvious cool factor Rocketbook makes an amazing gift. 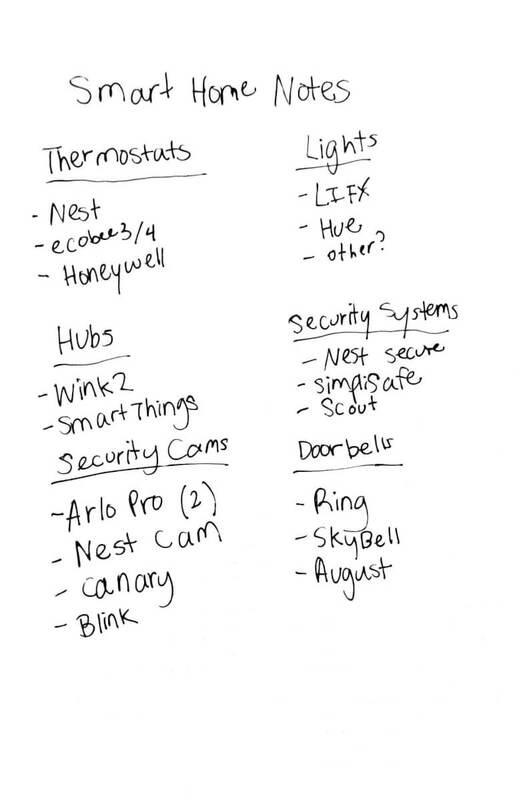 In my mind, it’s one of those smart gadgets that makes sense and actively makes life much easier. Besides the Rocketbook Everlast, there are a few other notebooks by Rocketbook that have the same cloud service functionality. One option is the Rocketbook Wave, which erases in the microwave. 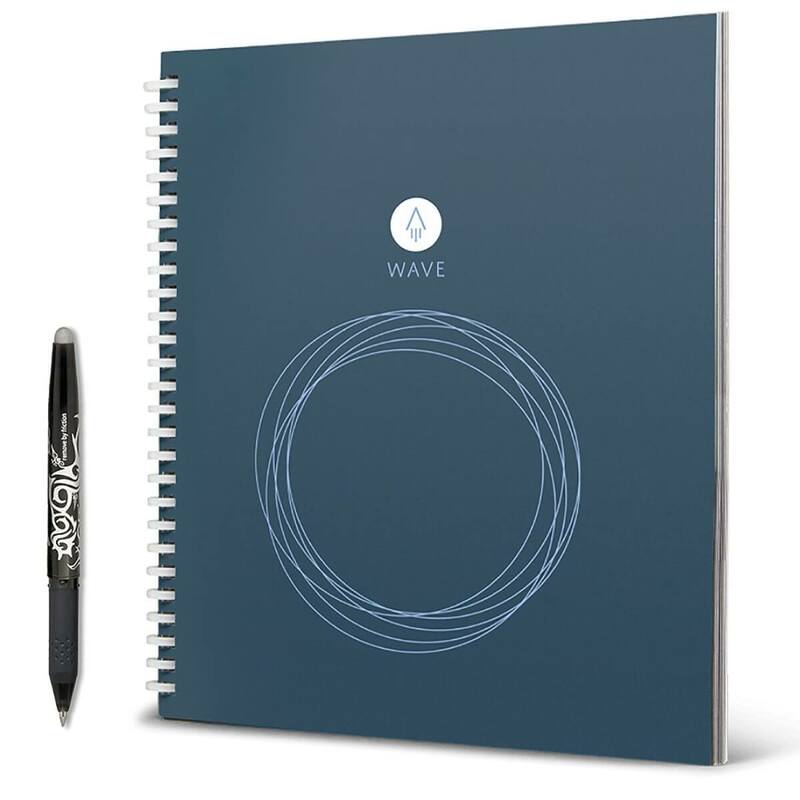 We compared Rocketbook Wave vs Everlast in-depth, if you need more details about the two. Simply microwave it with a mug of water on top and your notebook will be magically empty. Unlike the Everlast, the Wave won’t last forever, and is only good for 5 uses, just like if you reheat your leftovers too many times. 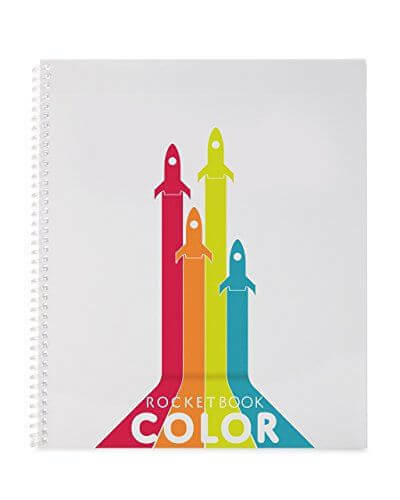 Rocketbook Color is the larger dry erase version, which is designed for artists, doodlers, and kids. That’s a wrap on our Rocketbook Everlast review. How would you use the Everlast? Let us know in the comments below!